SPT-20AB is the part number for our Hot Tips (replacement spouts and caps) for Satellite City 1,2 and 4oz CA glue bottles in bulk cases of 2000. 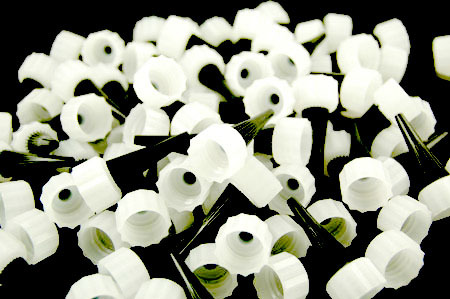 The quantity selected is the number of individual spout/cap assemblies. Hot Tips are the replacement spouts and overcaps for our 1,2, and 4oz bottles of Hot Stuff Original thin CA glue, Super T medium gap-filling CA glue, and Special T thick ultra gap-filling CA glue. If you are having problems with spouts clogging, you may first want to read up on why CA glue spouts clog and how to prevent it. However, sometimes you can't control the situation that is causing your spouts to clog. If that's the case, we offer replacement spouts and overcaps. This item comes in cases of 2000; if you just want a few spouts, choose our HT-600 2/Box Replacement Spouts and Overcaps for 1,2, and 4oz bottles of CA Glue. We also offer packs of 12 and packs of 100. These spouts fit our 1, 2, and 4oz bottles. They are 20mm with a 410 neck finish. If you are interested in a few as samples, please place an order for one of the smaller packs linked above.